While the term robotics connotes a mechanical device, RPA refers to software applications that replicate actions or tasks exactly like a human would. In other words, the software behaves like a robot, following a prescribed set of instructions. RPA robots are adept at automating repetitive and routine data entry tasks – even complicated series of tasks. And they do it better, faster, cheaper and more accurately than any human can. When companies can leverage technology to do more with less, they free precious resources for strategic tasks that grow profits and increase service levels. Robotic Process Automation is used in a wide variety of industries, including healthcare, financial services, service providers, manufacturing, distribution and insurance. From invoice data entry, credit applications, claims processing, general ledger allocations, to payables processing and employee onboarding, RPA is a fast, accurate, highly efficient way to process large volumes of data, freeing your staff to focus on resolving anomalies and serving customers. The RPA software robots interpret and use structured data, which they can gather from multiple different systems. The robots can manipulate the user interface and perform required tasks. When they encounter process exceptions, they can either rule them out or transfer them to a human for reconciliation. The robots then update the target system or application. Your staff can review the data at key points during the process. RPA robots are manageable from a single web console, by non-programmer types. 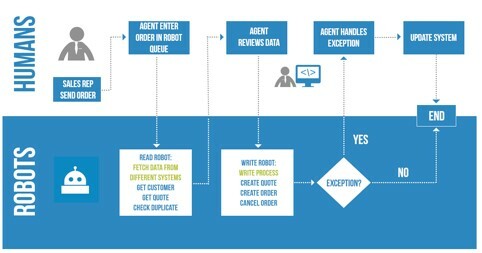 The graphic below parallels the course of a sales order data entry task as performed by a human and by a RPA robot. Let’s follow a real-life, common use for Robotics Process Automation, using the example of accounts payable invoice creation. The RPA software robot reviews an email box looking for PDF attachments, downloads and saves those attachments to a new folder. The robot then reads each PDF document and places pertinent information into Excel spreadsheets, saving each spreadsheet in a prescribed location. Next, the robot logs into the ERP application, accesses the accounts payable invoice data entry task and creates a new invoice associated with each initiating PDF. Finally, the RPA robot sends an email confirmation to designated user or users confirming completion of the task. RPA is growing dramatically, and for very good reason. Companies leveraging RPA report a substantial and rapid return on investment – from 30 to 200 percent in the first year alone. Many companies have minimal internal IT resources, choosing cloud software applications that simply don’t require the IT overhead of on-premise solutions. Other companies may have a larger IT department, busy supporting resource-heavy applications. RPA is ideal for either business model, as is seeing rapid growth both among users of legacy applications where coded solutions are not feasible or cost-prohibitive and among users of cloud applications. The reason it works so well is that Robotic Process Automation software is code free; it sits on top of your applications, interacting with the applications as a human would, not as a custom program does. Since it requires no real IT management, RPA can usually be deployed quickly by the operations side of the business, speeding the return on investment. Technology touches nearly every aspect of our lives, and much of that technology seems more revolutionary and transforming than RPA. Why has it taken so long for RPA to join the other innovate and disruptive business technologies we now see as commonplace? There are a few reasons many of us in the midmarket haven’t heard much about RPA. First, it is still a relatively new technology that is still maturing and hasn’t yet reached its height curve. Given its relative newness, and its initial traction among large corporations, there’s a trickle-down effect that’s just beginning to flow. Also, the technology hasn’t had a public champion promoting it. We have no doubt that as time goes by, the technology will grow exponentially and into many spectrums of the market. Larger companies long ago recognized that paying its workers to perform rote data entry tasks day in and day out is costly, error prone, and inefficient. In response, they often outsourced those tasks to less costly overseas workers. Could RPA bring those jobs home – to domestic robots? Estimates from experts at Deloitte Consulting and Everest Group (among others) place the cost savings of RPA over outsourcing range from 20 percent to over 70 percent. We help companies deploy Robotic Process Automation (RPA) software to automate repetitive tasks and build value and opportunity. Contact us to discuss RPA and your business.